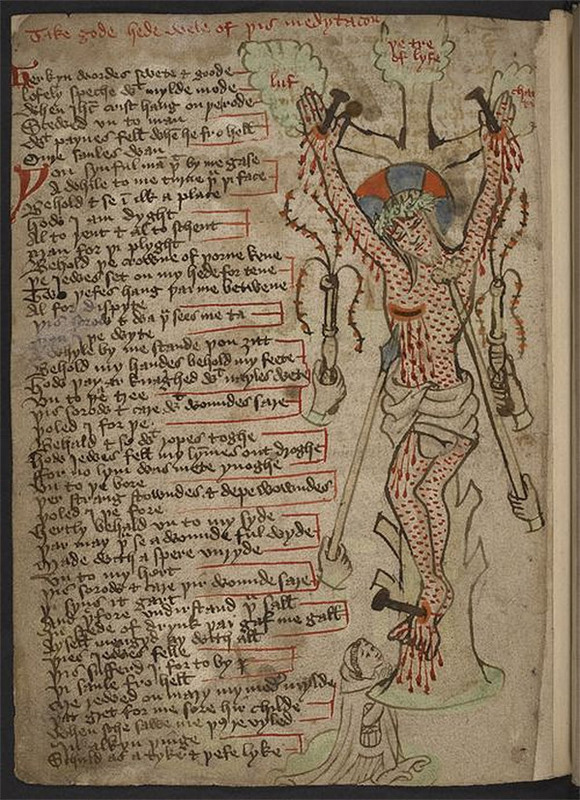 These images are from 15th-century collection of Middle English religious verse. 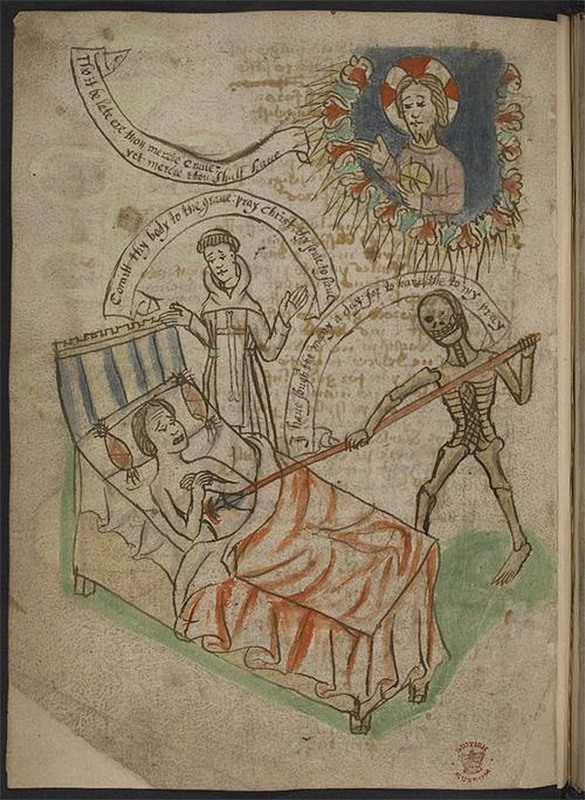 Almost every page in this manuscript contains at least one image, and these are not images for the faint-hearted: they vary from the sickly-sentimental to the macabre to the ridiculous and are crammed with medieval religious symbolism. The image above shows a drawing of a man in a tree representing man’s life. He is being pursued by a unicorn which is thought to represent death, and he is trying to gather honey which symbolises worldly vanities. Meanwhile a white mouse and a black mouse gnaw at the tree trunk and four serpents beneath represent the four elements. At the bottom of the image a dragon’s open mouth (the hell mouth perhaps?) awaits victims – presumably the man risks falling from the tree into the open jaws below if he gets skewered by the unicorn’s horn. Death is a frequent subject amongst these pages. Below is the image of a man on his death bed as a monk prays over him and a figure of Death who has come to collect the dying man’s soul alongside a blood thirsty image of Christ being crucified on a tree. 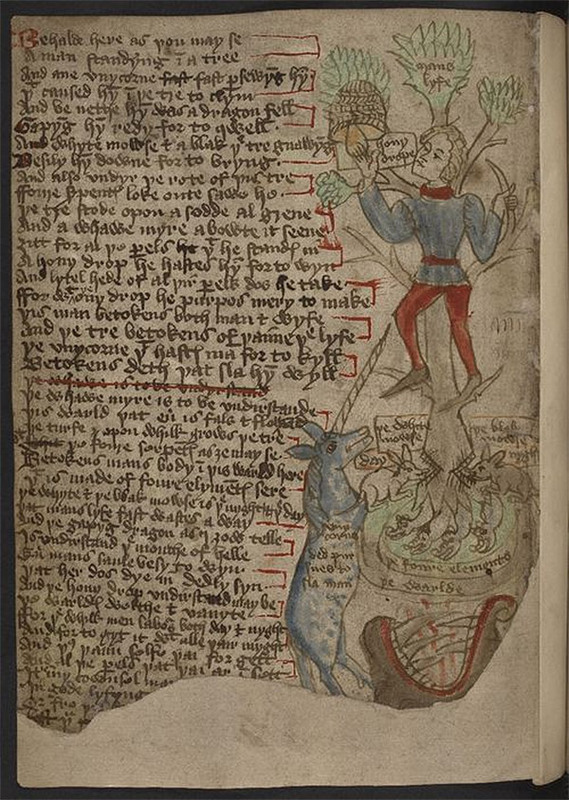 via the British Library’s Medieval Manuscripts Department.